Paris, France. Language: French. Publisher: Henri Plon, Plon freres. Editor: B. Du Vernet. 1/1, 3/March 30, 1854-1855. 32 pp., 6 francs within and 7 outside France. This was a pre-Kardecist, pre-spiritist journal devoted to the full range of phenomena that then passed under the word "spiritualist." Each issue focused on a single subject: the planchette (one of the first mentions of this spirit tool, by Henri Carion on "artificial evocations of the spirits who write with the aid of a crayon or pen attached to a planchette"), hauntings, "tables parlantes," a novel dictated by a spirit, sorcery, etc. Yve-Plessis describes its content: "Tables tournantes et parlantes. Espirits frappeurs. Apparitions. Spectres Fantomes. Mesmerisme. Somnambulisme magnetique. Trembleurs des Cevennes. Convulsionnaires de Saint-Medard. Possession des Ursulines de Loudun. Evenements du presbytere de Cideville. Femme electrique. Oracles anciens. Pythonisses. Obsessions. Possessions. Magie. Necromancie. Sorcellerie. Revenants, etc., etc." 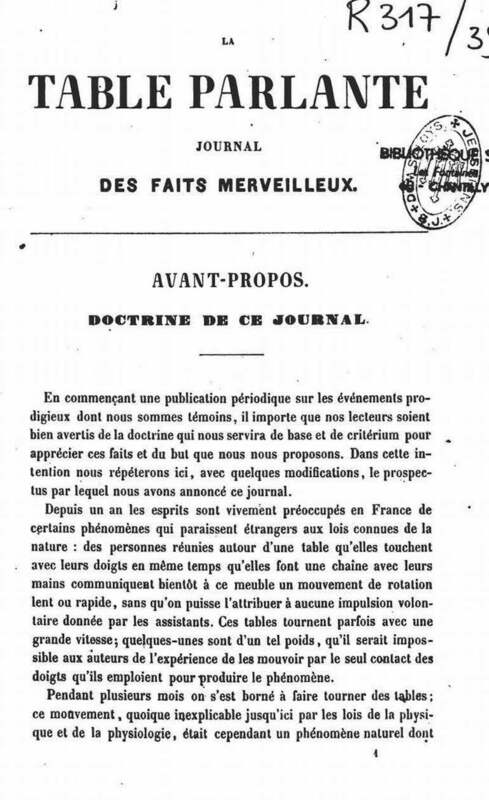 Robert Yve-Plessis, Essai de Bibliographie Française Methodique & Raisonnee de la Sorcellerie et de la Possession Demonaque (Paris: Chacornac, 1900). The review of it in the Revue Spirite in May 1864 (157-158) was scathing: "We have futilely reviewed it looking for something to include in our Revue; everything we might have used would be considered puerile and without interest today. If this journal had not ceased appearing . . . it could only have survived by placing itself on the level of progress of science, and, if it appeared today in the same condition as formerly, it wouldn't have 50 subscribers. Spiritists are far more numerous now than then, it is true--enlightened, and seeking a more substantial teaching." The Table Parlante had, according to the review, between 1,500 and 1,800 subscribers in its day. The journal closely followed developments in spiritualism in the English-speaking world, publishing Robert Owen's experiences with the "tables parlantes" in London through Mrs. Hayden, and the petition of Americans to the Congress. Crabtree 732. Bibliotheek van de Universiteit van Amsterdam; Universiteit Utrecht.